Where do we get the idea that tears are a sign of weakness? Who was the first person to come up with the ridiculous statement that says “real men don’t cry”? At what point do some of us feel ashamed of showing our vulnerability by revealing our tears? I encountered a moment awhile ago where I felt the pain from another family member about a situation that both of us shared, and the pain we felt about that situation. It was a pain about a situation that none of us could control, but that all of us felt the effects of. As I said goodbye to this person, I felt the tears welling up. This other person sensed the tears too, and we joked and laughed until we had parted ways. A part of me wanted to put the tears on hold – to put them in a compartment and save them for another day, but another part of me realized that if I didn’t let those tears express themselves, that they would harden me into a non-human being. And so I let them out, the trickle weaving a warm stream down my face. Even in that moment, I wanted to hide my face. I wanted to appear strong. But I could feel the relief of the tears as I let them be felt, let them be heard, and gave them permission to express the pain so that healing can occur. Tears are funny, when you think about them. They are so tiny, yet their presence is so potently powerful that they can command silence, cause anger, awaken empathy, or trigger other tears to be released. Have you ever been in an audience and someone is up to speak, and they begin to cry, and the room just suddenly feels different? A lot of people get very uncomfortable in this situation, but it’s raw and real and vulnerable. It’s like you can feel the emotion itself, rather than someone describing it. The room gets silent and the tears command our ears to listen. I’m not a big crier, except when I laugh. When I’m having a really good laugh, I know it’s good when tears are streaming down my face. Not tears of sadness, but tears of hilarity! When my stomach hurts, and my shoulders are shaking and my cheeks glisten, and I can’t breath, I know it’s a true moment of abandoned humor. It’s funny how those kinds of tears don’t carry any shame (unless you’re in an “inappropriate place” when you get the funnies). But crying is on another level. Movies are the worst. I remember being on a flight, in a seat between two other passengers that I didn’t know, and I decided to watch the movie, Marley and Me. Great movie. Lots of laughter – especially if you own a dog. But then, also, lots of tears. So there I am, wedged between 2 strangers, feeling vulnerable and exposed as tears are welling up in my eyes, and then trickling down my face. I felt embarrassed, but why should I? Where do we learn to hide the tender human heart inside of us? I remember as a child the cleansing feeling that would happen when you had a good cry. You know the kind: Where you cling to your favorite stuffed animal, bury your face into your pillow and sob away. And the feeling you get at the end, where you feel exhausted but also relieved – because you were you. You stared your emotion in the eyes and weren’t afraid to be the vehicle that carried the pain so that it could pass. When was the last time you had a good cry? Tears are sacred…think about that…sacred. 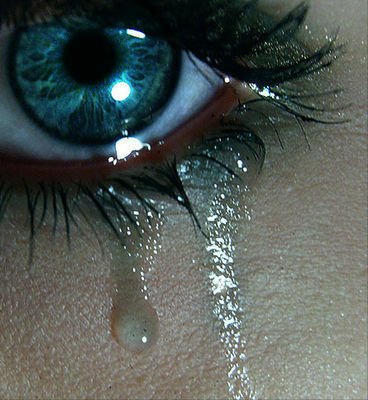 Tears express the inexpressible emotions that words cannot describe. Tears are like tiny gems that scream vulnerability and passion and love. Tears appear at all times, but are conjured up mostly by moments of sadness, awe, laughter, anger, fear, rage, compassion and love. Tears are not a sign of weakness, but rather a sign of strength, courage and healing. Tears, even though small, have the ability to take down the strongest wall of defense, if we let them. Tears, if not cried, can morph into hatred. Tears need a vehicle to be expressed, acknowledged, felt, and ultimately given permission to be released. We are that vehicle. I’m still learning about tears. I’m learning how to celebrate them more and not blink them away. I’m realizing that perhaps they are the very thing that will help keep me awake to the beauty and tenderness of life. What have you learned about tears? First of all, this is a much needed perspective for me. Thank you for unraveling and being being vulnerable. I love this post and this message. I’ve learned that tears feel good, I feel better when I let them flow. Tears are acknowledgement and acceptance. Tears are evidence of being connected with each other on a deeper level. Tears are wiser than me.